Scientists are traditionally cautious about attributing human emotions, such as grief, to other animals. But observations of cetacean behaviour in the last few decades have made the capacity of dolphins and whales to experience deep emotion more difficult to dismiss. According to a report by NewScientist, a growing number of observations of cetaceans interacting with dead family members, together with the discovery that cetaceans have specialised neurons linked to empathy and intuition, suggest dolphins may have a "complex – and even sophisticated – reaction to death". Some recent observations come from the Amvrakikos Gulf in the Mediterranean Sea, where since 2006 Joan Gonzalvo of the Tethys Research Institute has studied a local bottlenose dolphin population. According to Gonzalvo, during one expedition his research team observed a mother dolphin repeatedly lifting the body of her dead calf to the surface. "This was repeated over and over again, sometimes frantically, during two days of observation," said Gonzalvo. "The mother never separated from her calf.... She seemed unable to accept the death". 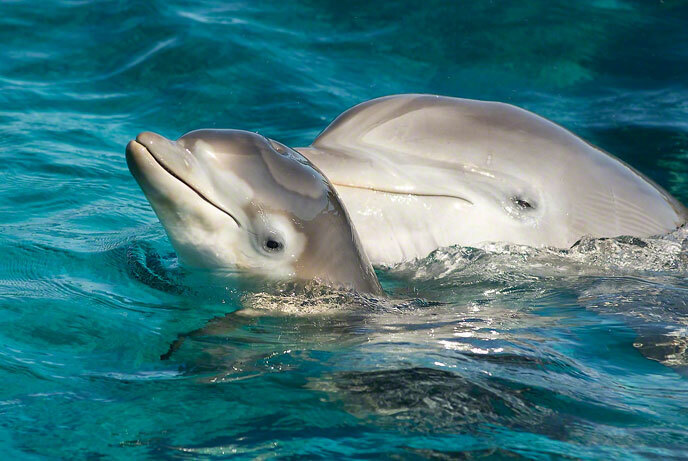 The footage in the video below is also of a mother and calf, which is thought to be the closest relationship in dolphin society. A group of tourists on a whale watching boat off the coast of California spotted the mother carrying the limp body of her tiny calf hooked over her dorsal fin. She was apparently reluctant to separate herself from the deceased baby. "This video sends a powerful message about how much a dolphin can care, it is a window into a dolphin's heart," Dave Anderson, the boat's captain, said in a statement. A sad sight: A grieving mother carries her dead calf on her back.